We're almost three weeks in the fall 2015 snook season and fish like the one above are all we've pulled out of the water. Catching something that fits the 28 to 33" slot limit is a real chore as usual. 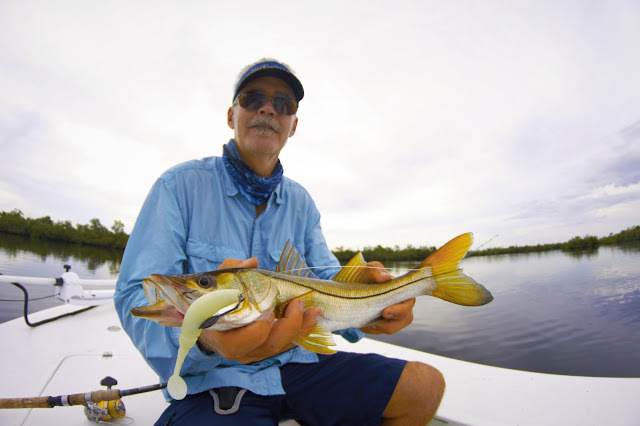 Undersize snook, like the 20" fish my buddy Tim Gleason is holding, are actually easy to land. Almost every shoreline in Matlacha Pass holds them, especially at high tide. They're still a lot of fun and will hit a lot of different baits, especially white plastics like the Flats Swimmer in the photo. We've got a lot of water around the mangroves at sunset all weekend and the rains are finally ending. Good news for a change.